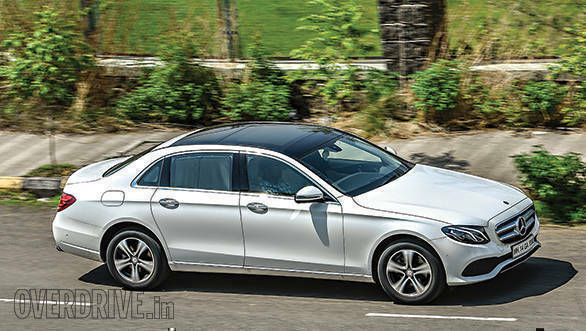 Mercedes-Benz seems to be on a roll after launching the new-generation E-Class in India. The E350d has received a good response, and the German manufacturer has now made the car more accessible by launching the new E220d. This E-Class gets a brand-new, all-aluminium, made for India, 2-litre diesel motor in a long-wheelbase (LWB) version that's specifically made for Indian and Chinese markets. It goes to show how important this segment, where cars are mainly chauffeur driven, is for Mercedes-Benz. But it faces competition from a manufacturer that brings a different flavour to the table. The Volvo S90 boasts of gorgeous style, superb attention to detail and acres of rear cabin space. It has a certain novelty factor to it that makes it hard to overlook. Should Mercedes-Benz worry? The Volvo S90 is clearly the better-looking car here. Actually, it is, to me, the most stunning design in this segment. One look at the car and it instantly manages to hold your attention. From the concave, chrome grille to the low roofline and distinctive tail lamps, the Volvo is breathtaking to look at. The car manages to turn heads, wherever it goes, and after a point in time, I simply lost count of the number of appreciative glances that the Volvo garnered. In a hotel porch, crammed with an array of German luxury cars, the Swedish Volvo simply stands out. It makes you feel special, which I believe should come as standard when you are shelling out this kind of money. There was a time when the C-class, E-Class and S-Class looked as different as chalk and cheese, but the current crop of these sedans are anything but. The new E-Class is not as good looking as the S90, but as a smaller S-Class, it's also very good looking. Just not as unique or attractive as the Volvo S90. 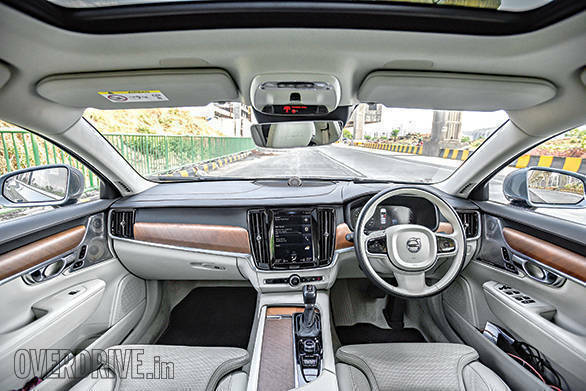 The Volvo's special feeling continues on the inside too and even in here, the distinction to other cars in the segment is quite apparent. The clean and simple cabin design, similar to the XC90's, is utterly gorgeous with focal point being the tablet-style, 9-inch infotainment system. The choice and quality of materials used is also top-notch, particularly the non-lacquered wood trims and the aluminium inserts. The other highlight is the 12.3-inch TFT instrument panel and the awesome 19-speaker Bowers & Wilkins sound system that's leagues ahead of the unit in the Mercedes-Benz. The S90's Nappa leather seats, designed with inputs from orthopaedics, are extremely supportive. Though they may seem a tad firm in the beginning, they are extremely comfortable over long distances. Passengers at the rear will also appreciate the generous legroom and headroom, despite the sloping roofline. Step into the Mercedes-Benz and you instantly notice the modernity of the design and layout. The high-resolution, 12.3-inch infotainment system is crisp and offers a multitude of information in vivid colours and graphics that looks like it came straight out of a high-end LED TV. The centre console is finished in glossy black; however, it's prone to pick up fingerprints and scratches. The steering wheel is a tad better to hold and features a touchpad to toggle between different menus on the colour display that sits in between the analogue speedo and tacho on the instrument console. What I particularly like is the matte wood inserts that wrap around the dashboard, akin to a luxury yacht's. 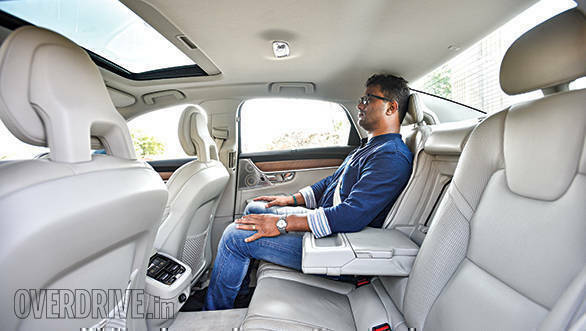 The quality of materials in the Merc is a notch above the Volvo's too and overall, this cabin has a slight edge over the S90's. And we haven't even discussed the rear seat yet! 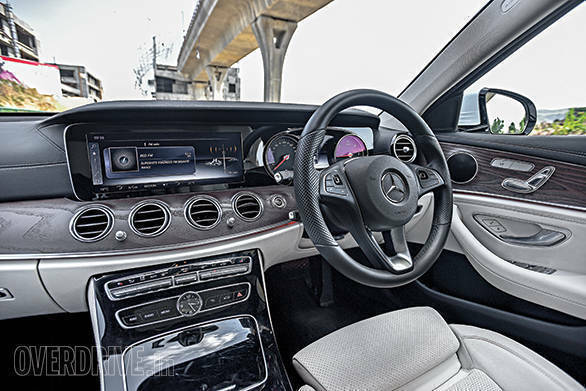 It's obvious that most of the buyers in this segment would be chauffeur driven, and in this case the E-Class has a truck load of tricks up its sleeve. The rear left seat is the place to be in this Mercedes-Benz. Firstly, there are acres of room, thanks to the long 3,079mm wheelbase. Then there's the reclinable seat back that tilts up to 37 degrees, with a cushioned headrest, allowing you to relax and unwind in utmost comfort. You can also choose to block the world out by shutting the electrically operated sunblinds on the rear windows and windscreen as well as the panoramic sunroof, the controls for which are placed in a cluster on the door. There's also a nifty switch, as part of the chauffeur package, that allows the rear passenger to move the front left seat forward to liberate additional legroom. For the clientele that Mercedes-Benz is aiming at, they've certainly covered every aspect. The star in the...er...three-pointed star is the lovely 2-litre, all-aluminium diesel motor, a first for Mercedes-Benz. The four-pot motor produces 197PS at 3,800rpm and 400Nm between 1,600-2,800rpm. 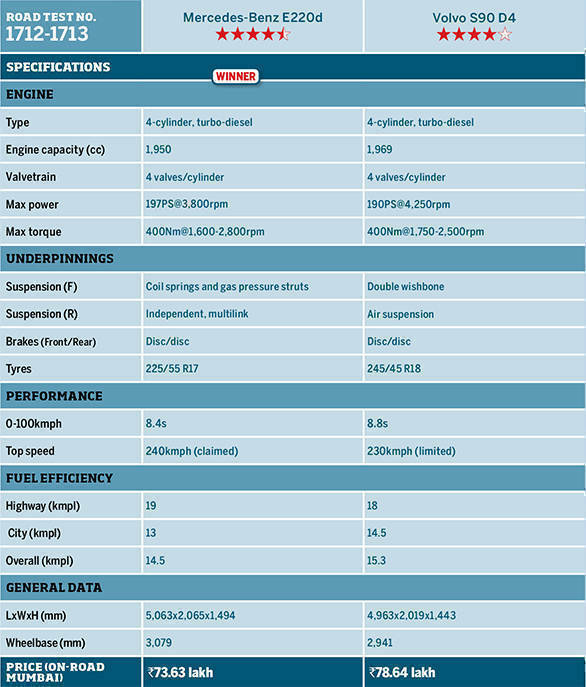 The engine is highly refined and there's barely any noise, even at high speeds. The motor is mated to a 9-speed transmission, which is one of the most responsive units in the business. Four driving modes are available - Eco, Comfort, Sport and Sport+ - each alters the steering, throttle response and transmission shift points. Comfort is ideal for driving in the city while Eco mode optimises all parameters to deliver the best possible fuel economy. Sport and Sport+, as the name suggests, push the shift points higher up in the rev range, with the engine unleashing maximum performance. In addition, there's an Individual mode too, that allows the driver to set individual parameters. The well-spaced ratios ensure that the E-Class' engine is never strained, irrespective of the speed that the car is cruising at. For instance, at 115kmph, the motor is barely turning over at 1,500rpm in eighth gear. Ditto at 135kmph, in ninth. This unstrained nature is in line with the character of the car and it's what makes cruising in a Mercedes-Benz so pleasurable. Also, despite nine gears in the Merc, it shifts down instantly, skipping gears to get you to where you want, in a jiffy. The Volvo's 2-litre, D4 motor, on the other hand, may seem outclassed with its 190PS and identical 400Nm figures, but the difference in reality isn't as stark as one may perceive. While the engine is not as refined as the E-Class', it does feel a lot more punchy. The Aisin-sourced 8-speed gearbox is equally good and is quick to respond to throttle inputs. Our tests also revealed that the Volvo is a mere 0.4 seconds slower at the 0-100kmph dash, recording 8.8 seconds to the Mercedes' 8.4 seconds. 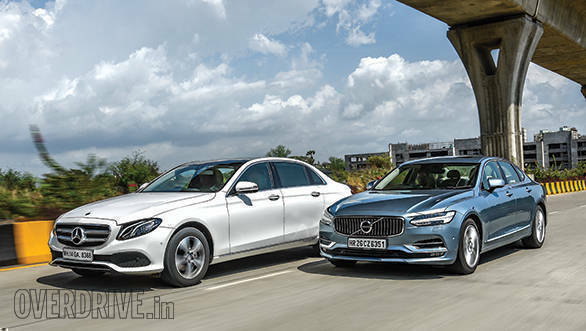 In terms of fuel efficiency, the two are also quite evenly matched with the Volvo returning slightly better economy in the city, at 14.5kmpl, compared to the Merc's 13kmpl. 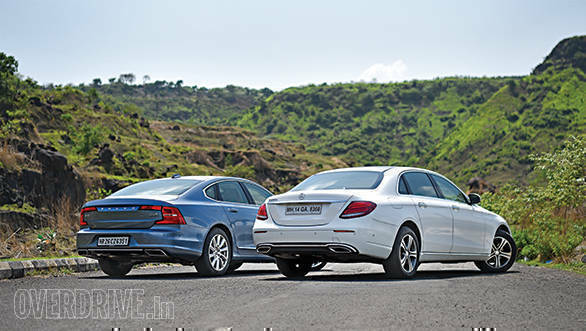 However, the E-Class does have a slight upper hand on the highway, returning 19kmpl as opposed to the 18kmpl that the S90 managed. Considering the audience that these cars cater to, the Volvo and the Mercedes-Benz's suspensions have been tuned to prioritise ride quality. 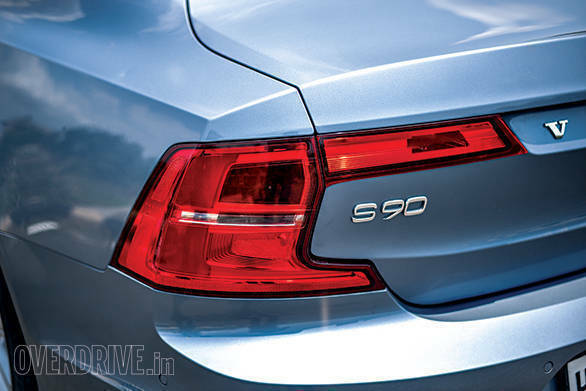 While the S90 has a slightly advanced suspension set-up, with double wishbones up front and air suspension at the rear, it's the E-Class that offers a slightly better ride. 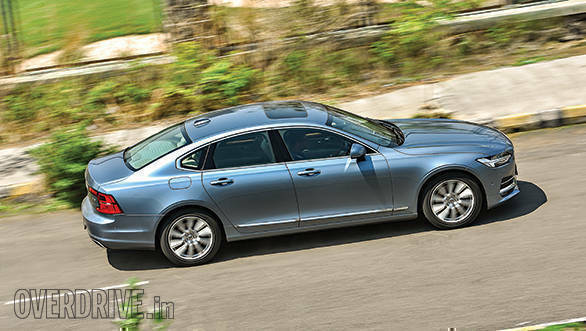 Besides the suspension set-up, one of the reasons why it manages to do so is because it runs on relatively high-profile 17-inch wheels while the S90 rides on 18-inch wheels with lower-profile rubber. The Volvo, however, feels a little more entertaining and connected when you get behind the wheel. Slot the car in Dynamic mode and everything gets turned up to eleven. The throttle response is sharper and the engine feels a lot more eager. The air suspension also stiffens up a bit to offer stable and confident cornering. It is no BMW, for sure, and neither does it pretend to be. Volvo aimed at endowing the S90 with predictable dynamics and that's exactly what they've done. For a car that's over 5m long, the E-Class handles pretty well too, but don't expect to go corner carving with it. The E-Class is supposed to transport its passengers, while keeping them isolated from the world outside, and that's how the suspension behaves too. It keeps the car planted around bends with barely any roll or body movements. In a nutshell, the Volvo feels a lot more connected, which I personally prefer. The S90, as we've said before, is in a niche of its own. It looks utterly stylish and I can't think of anyone who didn't appreciate its distinctive Swedish design. It's a car that struck an emotional chord with me and for that reason alone, I would pay the Rs 78.64 lakh that Volvo asks for. But we live in a practical world, and in reality the Mercedes-Benz is a superior product, overall. 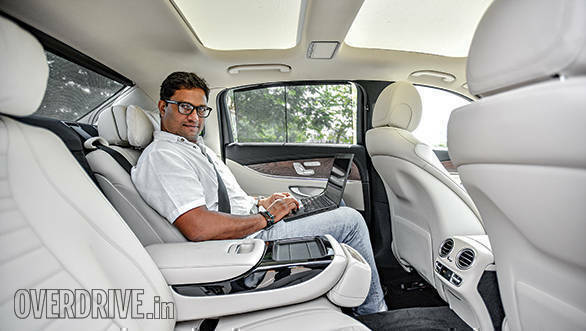 It feels a lot more modern, is loaded with features and arguably, has one of the best rear seats in the segment. At Rs 68.17 lakh, it's a whopping Rs 10 lakh cheaper than the S90, which pretty much makes the E-Class the more sensible purchase.